Are You Ready To Travel? 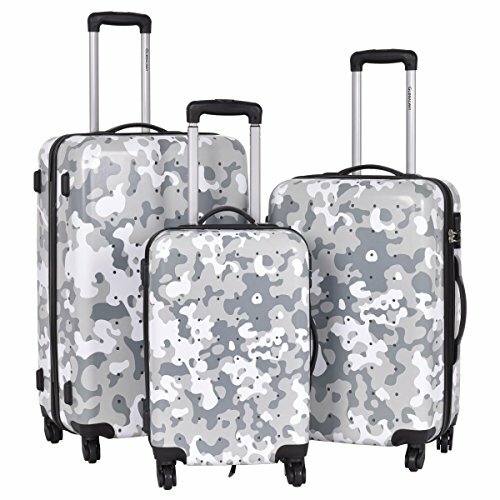 This Awesome, Hardsided 3-Piece Luggage Set Is Perfect For Traveling. No Matter The Multi-Directional Wheels, Or The Ergonomically Designed Telescoping Handles Will Add Much Convenience To Your Trip. The Spacious Main Compartment And Zippered Pockets Keep Your Travel Essentials, Your Small Valuables Well Organized. The Firm Coded Lock Guarantees The Security Of Your Luggage. Take The Luggage Set, Take Your Pleasure Along The Trip! Brand New And High Quality. Simple, Fashion Stylish Designed. Lightweight But Durable ABS And PC Hard Shell. Durable Multi-Directional Wheels, Rotating 360 Degrees. Main Compartment With Large Capacity. Ergonomically Designed Push-Button Handles Telescoping Handle. Safety Guaranteed With Firm Coded Lock. Fit For Traveling, Moving House. Resistant To Dirt, Easy To Clean Up With Rags. Color: As The Picture Shows Material: ABS+PC. Material Of Lining: 210D Polyester. Material Of Handle: Metal. Dimension: 20" Luggage Size:13"(L)×8.1"(D)×48.2"(Height W/Handle). 20" Handle Height: 12.6"-20.9". 24"Luggage Size:15.4"(L)×9.8"(W)×40.5"(Height W/Handle). 24" Handle Height: 17.3". 28"Luggage Size:17.3"(L)×11"(D)×40.5"(Height W/Handle). 28" Handle Height:13". Includings: 1×20" Trolley Case, 1×24" Trolley Case, 1×28" Trolley Case.